Whether you’re building an addition, completely remodeling or just finishing your basement, a home improvement loan can help add value and comfort to your home. With any type of loan, a higher credit score will give you better terms for your loan. But if you have a low credit score, that doesn’t mean a home improvement loan is out of reach. There are government loans, private lenders and co-signing opportunities that may be available to you. Home improvement loans are largely dependent on the homeowner’s equity, since this becomes collateral for the loan. 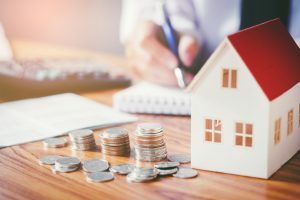 Even if you have a decent amount of equity, you will need to prove that you’re capable of paying your debts plus the added debt of the home renovation loan. The final terms of your loan agreement will be determined by your ability to pay back the loan on time. The lender needs to know the overall value of your home before agreeing to certain loan terms. Not every lender will require an appraisal of your home, but it helps to be prepared in case it’s requested. Before you apply for a loan, you should establish a baseline of estimates from professional contractors to determine how much your home improvement project could potentially cost. This will give you a good idea of how much you’ll need to borrow. Seeking out contractors for estimates will prepare you for what your project could entail. For example, you might be unaware that there’s mold in your walls which is something you’ll definitely need to take care of—and this will add to the amount you’ll need to borrow. While you're figuring out the cost of your project, be sure to request estimates from several contractors so you can shop around for the best price. What Are Your Home Improvement Loan Options? With a home equity line of credit, you’re able to withdraw money as you need it during a time limit that the lender has specified. Much like a credit card, as you pay some of the balance off, your credit will revolve and you can start to withdraw again. This line of credit can have fluctuating rates that can be higher than the rate you’d get on a fixed-rate loan, making them more risky. But there is more flexibility with a home equity line of credit than a fixed-rate loan. When it comes to home construction loans, lenders need to place a lot of trust in the builder, meaning they are usually very cautious about giving out these loans. If things go wrong, the lender could quickly realize they’ve made a bad investment. A borrower uses the equity of their home as collateral under a home equity loan. The value of your property will need to be determined by a licensed appraiser, and this will determine the loan amount you are eligible to receive. Usually this requires good credit and can end up being more costly than other loan options since additional fees associated with the appraisal, originator, title and closing process can come up. The federal government backs FHA 203(k) loans, which were established with the intention of revitalizing struggling neighborhoods. Under this loan, borrowers can purchase a property with the cost of repairs and upgrades included. The required down payment is as low as 3.5 percent in most instances. Make sure to follow the above steps and do your research on loan types as you’re planning to renovate your home! Jason Caruso has over 15 years of experience in the financial sales and service industry. He is currently a loan officer with Blue Water Mortgage, an independent mortgage broker serving Massachusetts, New Hampshire, Maine and Connecticut. Caruso has a degree in business administration and marketing.